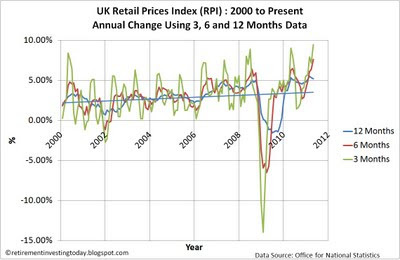 So we now have the UK CPI at 4.5% and the RPI at 5.2%. 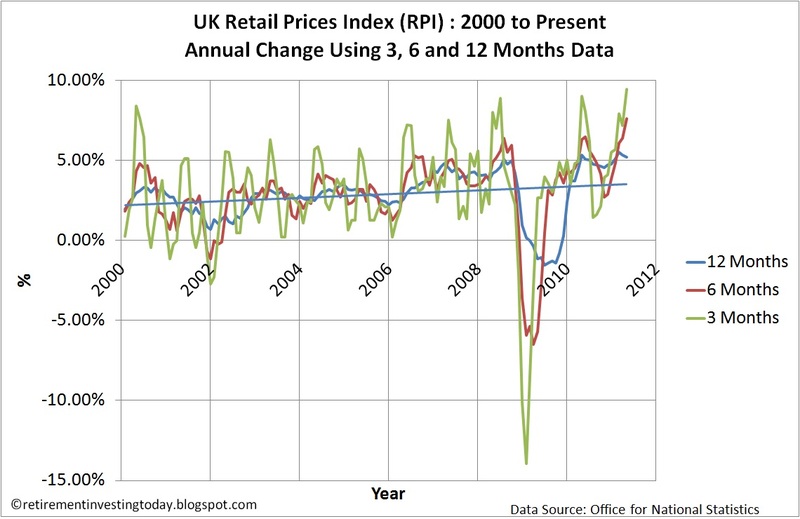 I haven’t blogged about the UK Inflation situation since my post back in August of 2010. Why? Well as I wrote back then I had accepted that the Bank of England was going to steal from me and all the other savers out there by inflating away the value of my savings. Also, while ever Mervyn and his mates (I think I’ll just call them the M&M’s from here in) keep interest rates at record lows of 0.5% this is going to continue so I really have nothing more I can add. All I could do was protect myself as best as possible by ensuring I had my target allocation of 5% in gold and also that I held onto my NS&I Index Linked Savings Certificates (reinvesting as they came up for renewal) while I waited out the current theft that is occurring. What I have however seen today though would be funny if it wasn’t so serious so it warrants a post. Firstly, the M&M’s in their August 2009 Inflation Report (Image 1 here) predicted that by now the CPI would be at 2%. What they didn’t say then though was the minor adjustments that were needed to make that 2%. This was kindly included in Mervyn’s latest letter to the Chancellor – “the current high level of inflation reflects three main influences: the increase in the standard rate of VAT in January to 20%, higher energy prices and increases in import prices. Although the impact on inflation of these factors is difficult to quantify with precision, it is likely that had they not occurred, inflation would have been substantially lower and probably below the target.” I find it kind of funny. It’s just like the CEO of a company saying that if we didn’t have to pay the workers then we would have made a profit. You just can’t choose to exclude things to make it look the way you want. How about I have a go. The current high level of inflation reflect twelve main influences (page 5 here): higher food & non-alcoholic beverage prices, higher alcohol & tobacco prices, higher clothing & footwear prices, higher housing & household services prices, higher furniture & household goods prices, higher health prices, higher transport prices, higher communication prices, higher recreation & culture prices, higher education prices, higher restaurants & hotels prices and higher miscellaneous good & services prices. Although the impact on inflation of these factors is difficult to quantify with precision, it is likely that had they not occurred, inflation would have been zero. This means that not only are we justified in keeping rates at 0.5% we might even consider lowering them. What success! I think I’ve just solved the UK’s problems. Secondly, back in the real world inflation seems to be getting worse not better. My first chart is taken straight from the May 2011 Inflation Report. The August 2009 report told us we would be at 2% by now however this latest report comforts us all by telling us that we have to now wait until April 2013 (while we watch our savings haemorrhage) for the Bank of England to meet their remit. So back in 2009 their estimate was only out by nearly 4 years! My second and third charts show reality. Inflation looking like it’s about to go exponential and that on an annualised basis, RPI over the last 3 months is running at 9.4%. Even better than that in the last month alone the CPI on an annualised basis is 12%! Thirdly back in August of 2010 I made the statement – “I can live with the Bank helping the reckless government and excessive borrowers by inflating away their debts. What I don’t like is the risk going forward. That is that we end up with yet another boom with these ultra low rates. Then the bubble is pricked and we get the bust. The Bank then has nowhere to go with rates because they are already at record lows. What do they do then?” It’s not quite a boom yet but the risks are certainly building. CITY A.M. has today reported that the global hedge fund industry has hit a record of $2.02 trillion (£1.2 trillion) as “investors have flocked to the vehicles to place assets due to above inflation returns during a time of low interest rates and uncertain markets”. So everyone is now chasing a real (after inflation) return and in doing so is ramping up their risk. The next bust really is going to be a beauty. It’s all going to end in tears. Meanwhile I’m sticking with my Retirement Investing Today strategy. What's kind of scary is that three extraordinary elements were cited. M&M could get away with it if they stuck with the VAT rise, indeed in January 2012 inflation will probably drop by 5% due to the VAT rise from 15 to 20% gets sucked out. The other elements, however, seem outside M&M's control. We must hope that they are a direct result of QE debasing the currency, in which case they will rattle out of the year long inflation sausage. If, however, they are the result of world competition for increasingly scarce fuel and food then we are stuffed. I hadn't realised hedgies were baaaack! I am seeing a lot of the hysteria we saw around interest rates back in 2008 all over again. The pleading for tighter money, or else the inflation will KILL US ALL. How did that work out in 2008? Saying we are in "not quite a boom" after real GDP growth is flat over six months, and with unemployment stuck around 8% for a couple of years... somewhat of an understatement, no? The 70's inflation went hand in hand with union militancy protecting real wages. Today in the UK real wages are falling at 2-3% a year - there is no inflationary wage/price spiral. M&M have to say dumb stuff because the inflation target is a dumb idea. They are doing the right thing by supporting the precarious level of investment and spending in the economy - and hence, employment. If you think (a) is desirable right now, I hope you don't hold any Sterling-denominated risk assets. If you think (b) is desirable, I hope you don't hold any non-Sterling-denominated assets. -> rant over, Lemondy out. I won't hold the VAT rise against them as I agree they can't do anything about it (now that is, they could have done something in previous years). We have Labour's policies to thank for that. If the Tories didn't raise taxes we would have seen more sterling devaluation and hence increased inflation through higher energy prices and import prices. 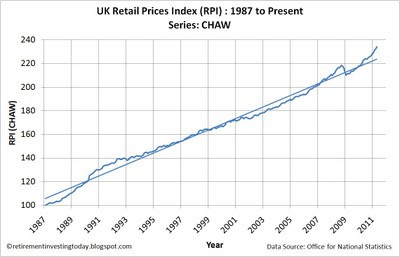 Although I do argue that that it is still a real inflation that is seen by the man in the street who can now buy less with his pound. Does anybody believe VAT will ever drop below 20% again. I don't. So it's real IMO. 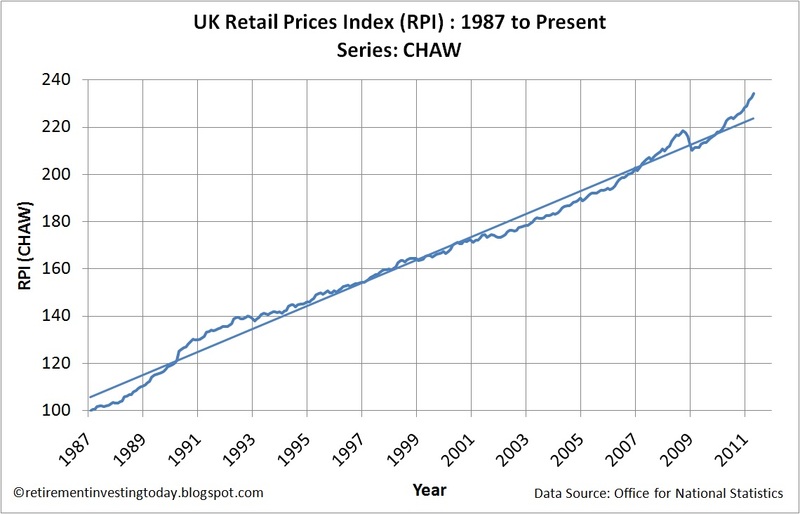 That said, IMO the M&M should have told Gordon Brown and his cronies the damage they were doing with the switch from RPI to CPI and also the bubbles they were blowing in the housing market years ago. It's not as though they didn't have the data. - cries of foul play from the indebted and house price drops (good the high prices are affecting our ability to compete on the world stage as everyone needs a big salary to pay their mortgage or rent). It will be painful but needs to happen. - send a message that care is needed when taking on debt and that you should not over extend yourself. Nobody has that message today as the indebted have just been bailed out so will carry on doing what they are doing. - cries that people are using all their earnings to service their increased interest payments so not pumping it into the economy. Well I can think of one group who would have more to spend under this scenario. The saver out there who would receive a higher interest rate and so might have something to now spend. - but finally, the pound will strengthen lowering import and energy prices. Great to hear from you. It's also great to get an opinion from the other side. Sorry I should have been more clear when I said boom. I actually meant in asset prices rather than in stuff that matters like GDP, unemployment etc as you rightly point out. I can find no value anywhere. Certainly not in housing, commodities or stocks anyway. I still maintain that inflation is stealing from me. A pound earnt yesterday buys less today than it did yesterday. That is a fact and real. It certainly doesn't encourage prudent actions from people - like save for a rainy day. Instead it encourages spend now and leverage yourself with debt. What's the problem today - too much debt - which the system encourages. I think ermine's post here http://simple-living-in-suffolk.co.uk/2011/05/nsi-bring-some-good-cheer-on-the-financial-front/ is excellent on the topic. Inflation is a stealth tax on savers. Why shouldn't people be able to store their wealth for their future? You castigate "imprudent" borrowers yet complain you have no easy way to store wealth... you cannot have it both ways. Everybody is free to store wealth by investing in real assets: start a business, build a house, buy some land and a tractor. If you want to store wealth through financial intermediation (e.g. put money into a savings account) you are reliant on *somebody else* wanting to use that money to create real wealth, and provide you with a return along the way. The status quo is that not enough people (and the businesses they run) want to take the risk of creating real wealth; in aggregate we all want to hoard cash. Saving and borrowing are two sides of an accounting equation; you cannot have a nation only of "prudent savers". Low rates are a symptom of the economy's malaise, not the cause of it. I have no doubt at all that M&M would greatly prefer to see capital investment over than consumer spending, but *any* increase in spending is what they want to encourage at the moment. I'm more than happy to store wealth by investng in real assets. I do that by buying shares in a company in exchange for some equity. I then hope they use that equity to create some value for society which in turn will result in some creation of wealth. I'd also be happy to store wealth through financial intermediation. The difference I think is that I would like that money to go to a sensible business through sensible lending levels who will use that money to improve their business. Rather than be given out in the form of 125% home loans which just indebt the population and bid up house prices. In the modern developed world what incentive is there to create real wealth. Why start a business with all the legal and tax complications that go with it when you can just just buy 50 houses, leverage yourself to the hilt and wait for the prices to be bid up and inflation to erode your debt. That's the bit I don't like and which is damaging society IMO. I believe you can have a notion of "prudent savers" but on the other side of the coin you just need "prudent borrowers" and "prudent lenders". >Why shouldn't people be able to store their wealth for their future? No reason, but you need to look at it over an economic cycle or two. Over the long term, cash has returned around 1% above inflation which is reasonable for an investment with minimal capital risk. The fact that it is not possible at the moment is a blip which will correct. Savvy investors have had plenty of opportunity to hedge inflationary risks through commodities, equities and NS&I IL certs. The less savvy will, for a while, lose out, just as if they buy goods in the first shop they come to without checking the sale offers down the road, but that is the nature of capitalism. I agree that cash should have minimal capital risk however I'm now starting to wonder and certainly glad I have plenty of NS&I ILSC's. After all it can just be created out of thin air. "Savvy investors have had plenty of opportunity to hedge inflationary risks through commodities, equities and NS&I IL certs." When you put it like that I can't really complain too much. Only 12% of my RetirementInvestingToday portfolio is in cash. The rest is indeed in NS&I ILSC's, gold (commodities), property and equities. That said I still don't agree with the policy of M&M. You still seem to be equating extremely low interest rates with "easy" credit conditions. The opposite is true. It should be reasonably intuitive: when was it easier to get a mortgage, 2006/7, when the base rate was around 5%, or today when it was 0.5%? How many buy-to-let lenders were operating in 2006/7? How many now? 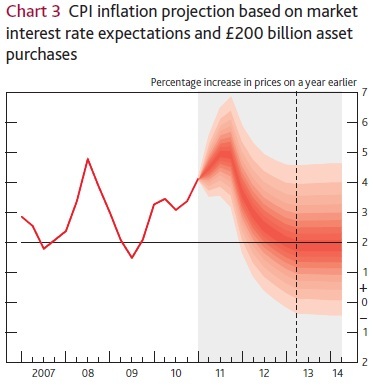 I have listened to almost every Inflation Report press conference over the last few years. I worry about inflation to a degree, because I worry that it is a symptom of structural problems in our economy, or that it is a result of resource depletion. But I have absolutely no concern that M&M have been doing the right thing for the economy, in the face of incredible pressure to do the wrong thing as soon as possible (and raise rates). If nothing else, imagine where your portfolio would be if M&M had not sent up a huge "FU" balloon to the hyperinflationists in March 2009 and printed a boat load of money. 5% RPI might be a bit higher than we got used to - hyperinflation it sure ain't. Fear the level of unemployment - don't fear the bogeyman. M&M know which of those is a real problem.